The first one occurred March 1st – 3rd and produced heavy snow, flooding rains, and damaging winds from New England to the mid-Atlantic. Wind gusts over 80 mph were common across New England including a peak gust of 97 mph in Wellfleet, MA. These winds created widespread tree damage along with over 2.2 million power outages. Meanwhile, Cobleskill, NY recorded almost 40 inches of snow! The storm also produced nearly 6 inches of rain around Old Saybrook, CT. The second nor’easter of the month slammed the Northeast on March 6 – 8th. Blizzard and whiteout conditions were reported up and down the I-95 corridor between Philadelphia and Boston. And even though the big cities “missed out” on the heaviest snow, locations not too far away were measuring snow by the foot. This included 26.8” of snow in Montville, NJ and 32" near North Adams, MA. Not even a week passed before the third nor’easter arrived on March 12 – 14th. Once again, much of the I-95 corridor received snow, but by far, the heaviest was located over New England where 1 – 3 feet of snow fell. The storm produced blizzard conditions once again along with another round of widespread coastal flooding. Some snowfall totals included 23.8" in Andover, MA, 18.3” in Southampton Long Island and 14.8” in Boston, MA. 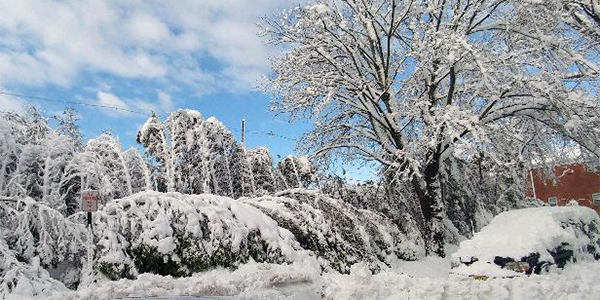 The fourth and final nor’easter struck the region on March 20 – 22nd. While most of New England missed out on the heavy snow, the rest of the big cities in the Northeast from Hartford to Baltimore received a healthy helping. Central Park received 8.2” of snow, Philadelphia 7.6”, and Baltimore saw 4.7” of snow. The highest amount of snow recorded was 20.8” in Patchogue, Long Island, which was certainly very impressive for so late in March.